So many more of us are working from a home office and with the kids back at school it's time to brush the sand from our toes, get the house straight and our heads back into work mode. I must confess I do love a bit of organising and get quite excited about sorting my home office out in September, saddo I know, but remember getting your new pencil case for the new term? it's a bit like that. Anyone with me on this? I've put together some of my favourite workspaces to help you find the inspiration to combat that “first day back” feeling this September. I love this creative space, baskets are always a winner for me, storing bits and bobs within easy reach. Natural materials and monochome, a match made in heaven - call me picky, but I'd probably pop a little plant on that desk. So much of your personality comes out in a home office, the little touches, how you organise things, what you have displayed on your wall. It's a great place to indulge the inner OCD, like, If anybody touches "my" scissors, they are in big trouble! The desk, it all revolves around this and what a thing of beauty this is. Danish interiors brand Hübsch do it for me every time. 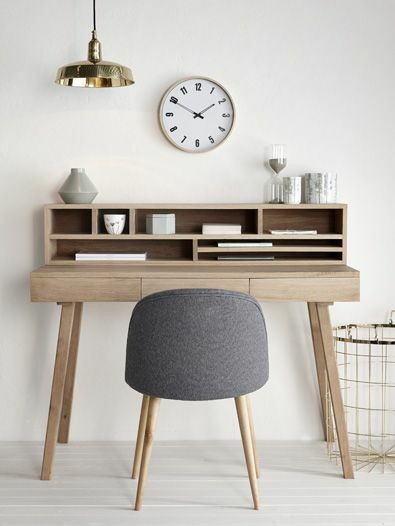 We've been coveting this for a while with an almost daily request from my husband "is that desk in stock yet?" Well, the wait is over, I've had a marker in my diary for months and early September is here and can soon call this centrepiece to the home office, ours. Want one? go on ........ add one to your basket here from the peastyle shop. Ready to make your home office a happy place? we spend enough time there, you deserve it as much as the kids 'need' that new rucksack!